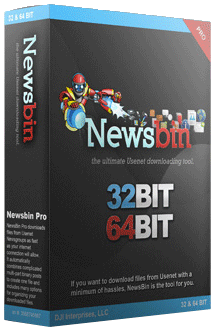 Newsbin is software for Microsoft Windows Operating Systems that downloads files from Usenet Newsgroups. It will run on Windows XP and newer, both 32 bit and 64 bit. An account with a Usenet News Server is required to use Newsbin. If you do not have access to a news server, please visit our Newsbin Recommended News Services list. Newsbin will take an NZB file and automate the full process to download, decode and reassemble the content of a NZB file*. Newsbin’s complete automation of large binary content downloading is the industry leader. No other tool will have a higher percentage success rate at getting the content of an NZB file downloaded and ready to use. Double Click a NZB file from Windows Explorer and Newsbin will download it. Drag and Drop a NZB file onto Newsbin and Newsbin will download it. Drop a NZB file in a folder that Newsbin watches automatically and Newsbin will download it. Double click a NZB file from a Newsgroup list within the Newsbin user interface and Newsbin will download it. Newsbin allows you to control the location of the resulting downloaded NZB file content. Specify the root folder where you want the NZB file download to land. Name the NZB file download folder based on NZB file name, Newsgroup name, Folder where the NZB file resides or combinations of these. Newsbin allows you to create NZB files from content you browse for within Newsgroups. You may select multiple posts and with a single click, tell Newsbin to create an NZB file of those posts. Newsbin is a Usenet newsreader client and requires a Usenet News Service provider account for processing any content from Usenet.